Earlier I posted a review of the revenues side of the Mayor’s proposed budget. Here’s the flip side: how the money’s being spent. A reminder: it’s a 2-year budget proposal for 2019 and 2020; the 2019 budget will be officially adopted and the 2020 one will be “endorsed” this year and “adopted” with changes next fall. Mostly here we’re going to focus on the 2019 budget, since it’s the only one that really matters at this point, but where there are interesting implications for 2020 we’ll note that too. Two of these, the two utilities (SCL and SPU), alone represent 45% of the city’s expenditures. 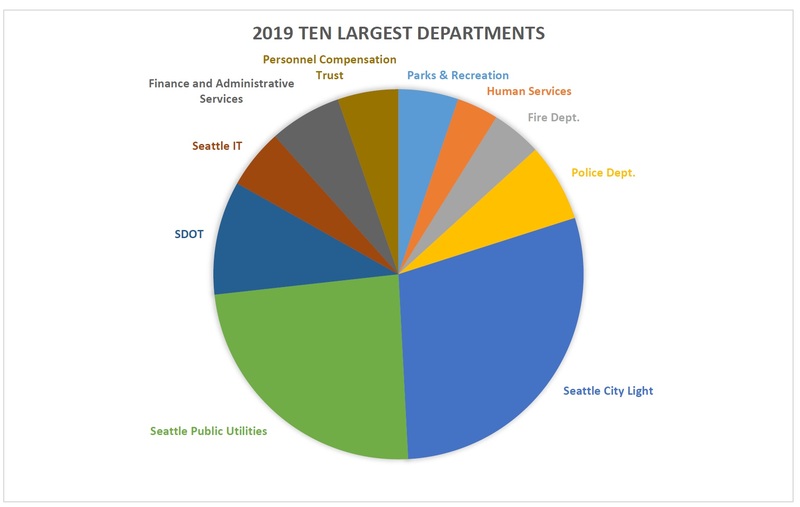 It’s almost unfair to include them in this list since in many ways they run as separate operations and the revenue they bring in from their customers can only be spent within the business (except for paying utilities taxes), but there is significant overlap these days in their operations with other city services like SDOT, the Department of Construction and Inspections, and the homelessness response so we really have to look at them together. You’ll note that there are two with significant growth over the years: SPU and SDOT. Some of the others have modest growth, and a couple are either flat or a slight decline. We’ll dive into each of these in a moment. First, though, it’s worth taking a moment to understand Mayor Durkan’s overall approach to her first budget. You may recall that when we went over the revenues there were clear signs of an approaching recession — both nationally and locally. The city has modest expectations for revenue growth over the next few years, and Mayor Durkan is unwilling to bet that the growth will exceed local inflation. Instead, she checked behind the couch cushions looking for spare change, and came up with about $50 million in savings across the city departments. That included reclaiming 150 vacant positions, most of which had been left unfilled for a long time; reducing discretionary spending including travel; and trimming departmental budgets for consultant contracts. She also signed an executive order to reduce the city’s vehicle fleet size by 10%, and plans to cut fuel costs by $1 million next year. The budget office compensated a bit for this by building in an “underspend assumption,” where departments that consistently underspend their budgets a predictable amount are allowed to overbudget with the assumption that they will continue to underspend (and therefore end up at the right amount). 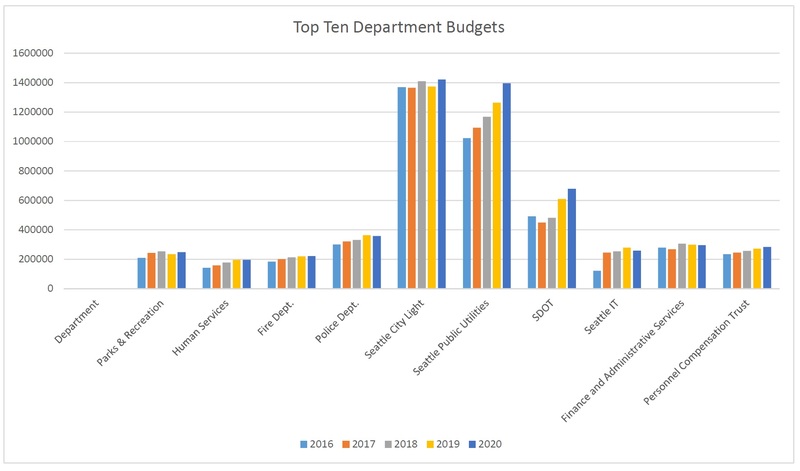 Now let’s look at each of the “top ten” departments and see what’s changing in their budgets. The city’s parks and recreation facilities are massive, taking up about 12% of the land area of Seattle. That includes 6400 acres in 485 parks and natural areas; 25 miles of boulevards and 120 miles of trails; 27 community centers; 8 indoor pools and 2 outdoor ones; 4 golf courses; 3 environmental education centers, 2 small craft centers, and an outdoor stadium. The city also owns both the zoo and aquarium properties, and contributes to the operations and maintenance for both. The Parks budget comes from three main sources: the city’s General Fund, the voter-approved Metropolitan Parks District (MPD), and Real Estate Excise Tax (REET). REET revenues can be fairly volatile and so it tends to get allocated and spent a year or two after it is collected by the city. The MPD funds are much more predictable, and the General Fund dollars are at the discretion of the City Council when they approve the city budget. The Mayor’s proposed budget allocates a total of $234 million to Parks and Recreation, which is a 7.6% decrease from 2018. The operations part of the budget ($163 million) increased by $2 million; the capital budget ($71 million) decreased by about $22 million. The budget is proposed to jump back up to $248 million in 2020, which shows the inherent volatility of capital projects over the years. The city says that they are continuing to chip away at the $270 million backlog of maintenance work; addressing that was a major selling point for the MPD, and they expect to complete 120 projects by the end of the MPD period in 2020. The 2019 budget includes an additional $6.2 million for replacing aging synthetic turf athletic fields; of the city’s 19 synthetic fields, 15 were installed between 2008 and 2010 and are due for replacement. The department aims to complete 3-4 per year. The budget also adds $610,000 for maintenance of newly-created parks, and $2 million for ADA-compliance projects in city parks. Also, the department intends to increase fees across the board to help defray increasing labor costs. One of the big issues facing the department is the four golf courses. With the number of rounds golfed declining and labor costs increasing, the current business model is no longer sustainable. The department is studying options for how to move forward, including potentially closing one of the courses — which would create a rush to claim the land for other potential projects including open space and affordable housing. The Human Services Department is proposed to see a 10.4% increase in 2019, to $195 million. About $12 million of that is dedicated to the homeless response — a 17% increase to that program. Between the City Council and the Mayor, several increases were made to that program throughout 2018, paid for with one-time funds such as the sale of a piece of public property. In addition to an overall increase in the budget, Mayor Durkan also proposes to replace those one-time funds with sustained funding from several sources including the sweetened beverage tax. The budget anticipates having at least 2300 emergency shelter beds available, with 70% of them being in “enhanced” shelters open 24/7 and with case management and other services. Enhanced shelters have been shown to dramatically increase the rate of exits into permanent housing compared to “basic” overnight shelters. The sustained funding will also cover this year’s expansion of the Navigation Team to 30 people, as well as funding for permanent supportive housing, rapid rehousing, and diversion programs. Durkan’s HSD budget also provides for a 2% wage increase for workers at nonprofit human service providers (many of whom are barely making ends meet now); it’s something, but it still lags the local inflation rate of 3%. The budget also adds $2.1 million in expanded nutrition and food access programs. SFP will see an increase of 3.6% to $219 million. Durkan and Chief Scoggins found several internal cost savings opportunities, and are applying much of that money to add 120 new recruits. The department is required to have 214 firefighters for minimum daily staffing, and is relying heavily on overtime at the moment to cover it; the new recruits won’t put more firefighters on the street, but it is expected to significantly reduce the overtime (and thus partially pay for itself). SPD’s budget will increase by 9.7% to $363 million. That will pay for 10 new officers in 2019, with another 30 planned for 2020. It will also fund the revival of the Community Service Officer (CSO) program, with an initial 12 CSOs. 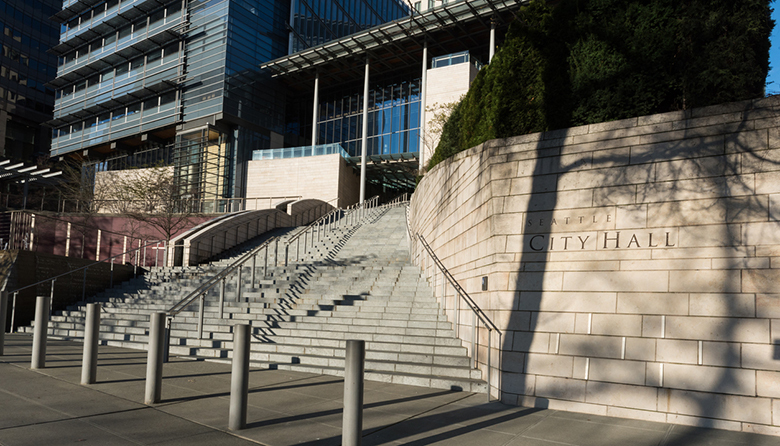 As of when the Mayor’s budget was published, the exact impact of the new contract with SPD officers was not completely understood; the city has been setting aside funds in anticipation of a new contract, knowing that a raise would likely be retroactive back to 2014 when the previous contract expired. Expect to hear more later this month when the City Budget Office provides an update to the Council. Some advocacy groups have already objected to an increase in police officers when more money could be spent on human services and addressing the homelessness and affordable housing crises. On the other hand, in the 2017 Public Safety Survey, every neighborhood in Seattle except one listed “police capacity” as a top issue. The city’s public electric utility expects a 2.5% drop in total expenditures to $1.37 billion. The operations part of that is flat at $1.02B; the capital budget drops about 10% to $351 million as some projects wrap up and others start. It’s broadly recognized now that Seattle City Light’s business plan isn’t sustainable, as retail revenues continue to decline, wholesale prices drop, and capital costs rise. This isn’t unique to City Light, however; it’s an industry-wide problem. Now that the utility has a new CEO, Debra Smith, Mayor Durkan intends to work with her on a new long-term strategic plan. In the meantime, the utility is tightening its belt through a number of measures and hoping that it won’t affect the level of service it provides. SPU will see a big increase in 2019: 8.2%, to $1.26 billion. For many years SPU has been the little brother to Seattle City Light, but by 2020 the two will be nearly the same size. At least for a few years: SPU’s main driver of the growth in expenditures is the federally-mandated Combined Sewer Overflow pipeline project to stop untreated sewage from spilling into local waterways during major storms. Once that project is complete, SPU’s capital expenditures will probably drop back down. SPU will also be addressing the long wait times in its customer care center (which it shares with SCL) by adding 24 additional employees there: 12 permanent ad 12 temporary — with the hope that after City Light finishes rolling out new digital wireless meters the load will go back down. SPU is also expanding its Clean City Program that picks up garbage from public spaces and unsanctioned homeless encampments around the city. Durkan’s budget adds another $700,000 to that program. SDOT is a big recipient of Durkan’s largesse this year, with a 26.9% increase in its budget to $609 million. With the “period of maximum constraint” beginning shortly, the Mayor wants to make several investments to get people out of their cars and into transit. First, SDOT will be purchasing an additional 100,000 hours of bus service from Metro above the 270,000 it currently pays for. It will also make street signal improvements and other capital investments to improve transit speed. The budget also makes a contribution to Sound Transit to allow the agency to begin planning for an infill light rails station at Graham Street. There are several looming issues for SDOT. First, it is concerned that under the Trump administration the opportunities to leverage federal funding for transportation projects may be limited in the coming years. Second, there are the two existing streetcar lines, and the proposed Center City Connector streetcar that is currently on hold while an engineering review is completed this month. At the end of each year, Metro reconciles the estimated and actual operations costs for the First Hill and SLU lines, and sends a bill to SDOT if it underpaid (which it usually does). The city has been using interdepartmental loans to cover those extra costs for the past few years, but Durkan’s budget repays those internal loans ($5 million) and adds additional dollars to the 2019-2020 budget to more accurately reflect the likely operations costs to avoid running further deficits. As for the Center City Connector, Durkan left in the original funds planned for the buildout of the line, though she didn’t add any additional funds to cover overruns — even the ones already identified. Once the engineering review is complete, if the project still moves forward that will need to be fixed — though the city is skeptical that given the project’s delays it would exceed the amount budgeted through 2020. So they are kicking the can down the road. Third, there’s sidewalks. In the Council’s briefings on the budget, Council member Juarez stated that she wanted to see far more money for building out sidewalks — especially in her District 5. Look for her to propose a change in the budget. Fourth, there’s bike lanes. The city has been slow to deliver on the promised Bicycle Master Plan, and advocates are running out of patience. Look for a push to move more quickly on bike lane projects, especially ones that connect up separate pieces of the existing network. The city’s centralized IT department is proposed to have its budget increase by $24.8 million to $278 million, a 9.8% increase. $15 million of that is just on paper: it is being “refunded” to other city departments because Seattle IT overcharged them last year. $12 million will be spent on sixteen new department-specific IT projects; $2 million will go to a new HR information system; and $2.75 million will pay for a new city-wide contract management system. • $2.9 million additional for facility operations, including increasing lease costs at city-occupied facilities, and security for the Fort Lawton site while the city waits for an appeal of its development plan to conclude. Several City Council members expressed surprise and concern the city was spending money on security there, but the owner of the property, the US Army, is insisting that the city keep it secure while the development plan and the pending sale of the property to the city are still in limbo. There have been recent break-ins at the currently-vacant buildings on the property. • Overall, FAS’s capital budget decreases by $17 million, but it includes a new $18 million line-item for a new cooling system for the Seattle Municipal Tower. The Personnel Compensation Trust is the fund that the city uses to self-insure for its 11,000 city employees for health insurance, industrial insurance, unemployment insurance, and group term life insurance. The city expects to spend $271 million in 2019, a 5.6% increase from 2018. $240 million of the total, and nearly all of the 2019 increase, is for health insurance. That’s right, next year the city will spend nearly a quarter of a billion dollars on healthcare for city employees. One other department worth a quick mention is the Office of Housing, which awards grants for affordable housing projects. Its budget is nearly unchanged in 2019 at $69.1 million. Most of its funding — and the predictable part of it — comes from the Seattle Housing Levy. It also gets funds from the city’s Incentive Zoning and MHA programs, but those are unpredictable sources tied to private development; for example, the Office of Housing will be getting a windfall this month from the Washington State Convention Center expansion project. With the lack of affordable housing at crisis level, there is substantial pressure on city leaders to provide additional funding to the Office of Housing. Durkan’s budget doesn’t do that, but we will have to see whether the City Council chooses otherwise. Two years ago it issued $29 million of debt to fund affordable housing; last year (and again this spring) it failed to sustain an “employee head tax” that would have provided a substantial amount for housing. So far this year, there is much complaining among City Council members that the head tax was repealed, but no new ideas for funding sources. Overall, Durkan’s proposed budget is solidly middle-of-the-road. It’s hardly an austerity budget, with only minor belt-tightening in most departments and programs. But there are no “big bets” either, with the possible exception of the transit investments in SDOT to deal with the “period of maximum constraint” — and most transportation advocates in the city will mildly applaud those efforts while declaring that they fall far short of the grand vision Seattle should have for its transportation infrastructure. Also with no new significant investments in either affordable housing or the homelessness response, advocates for those areas will have much to complain about too. But without new sources of revenue, Durkan has few options for meeting any of those demands, and the City Council is unlikely to fare any better.